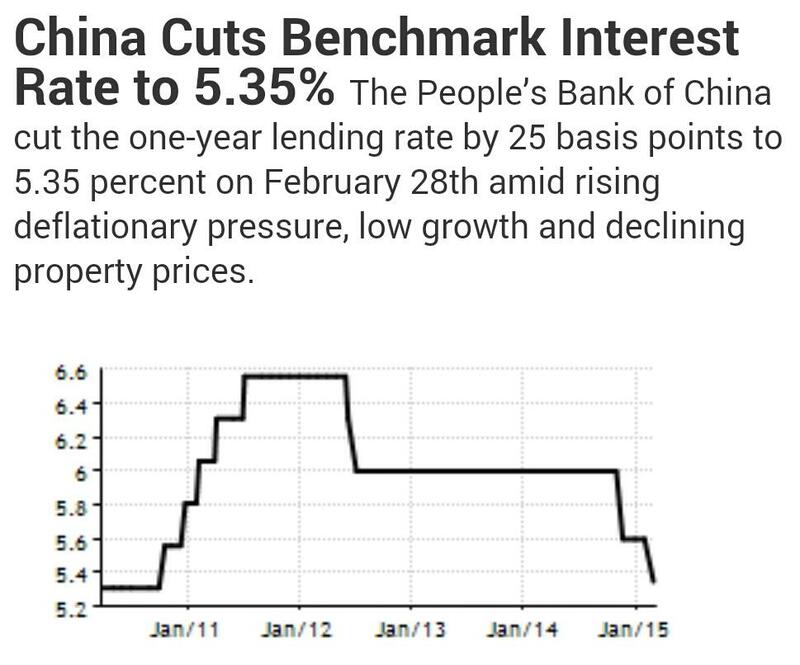 China's central bank followed up with a second rate cut this year. While many believe this is a step in the right direction, the move alone will do little to reduce high real rates and tight effective monetary policy. 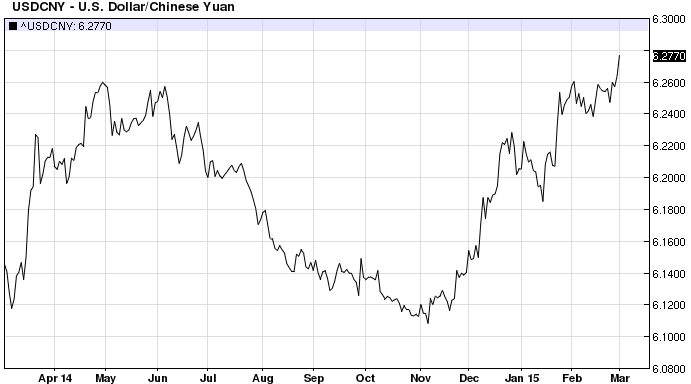 In fact money market rates in China have been rising. Here are the overnight and the 1-week SHIBOR (interbank) rates for example. At the same time inflation has been moving lower, with CPI hitting 0.8% YoY in the last report. This results in real rates that are are multi-year highs (chart below) in a slowing economy. The situation in the repo markets is similar. The effective monetary policy is just too tight and these real rates are not sustainable - many more cuts will be needed. The PBoC pointed out that the reason for the cut was to achieve "real interest rate levels suitable for fundamental trends in economic growth, prices and employment". Market participants and economists remain a skeptical. Deutsche Bank: - The rate cut is not enough to stabilize the economy. We believe growth will continue to weaken in March and Q1 GDP will drop to 6.8% (consensus 7.2%). The key issue is whether the central government will loosen fiscal policy significantly and quickly enough to offset the slide of fiscal spending on local government side. We do not see signal of such easing yet. Without meaningful pickup of fiscal spending, growth momentum will likely weaken further. 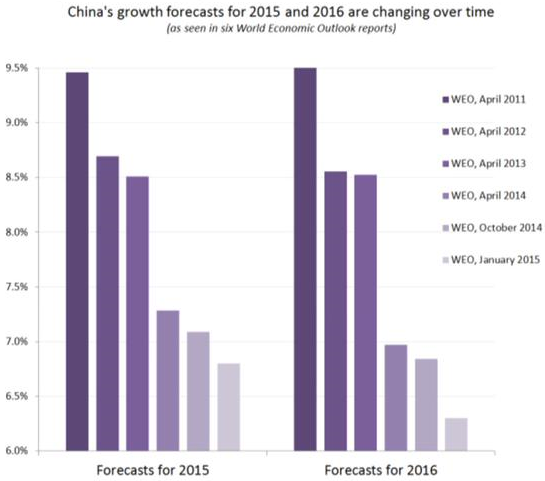 The expectations are that a whole series of cuts could be coming as China's growth slows further. That's why just as the short-term rates rose recently, markets view these rates falling significantly in the longer term. The rate swap curve has become even more inverted over the past month. 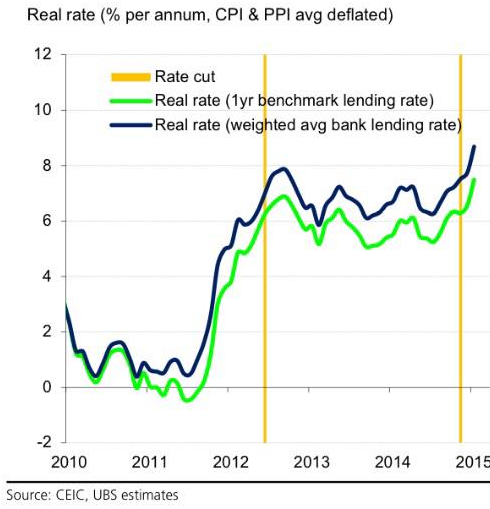 With recent talk of a US rate hike in 2015, this puts the Fed and the PBoC on a diverging policy trajectories. That exerts further downward pressure on the yuan which now trades at the lowest levels since 2012. The chart below shows USD appreciating against CNY. Many now believe that Beijing will soon let the USD/CNY peg go. With rate cuts alone insufficient to stabilize growth, weaker currency may be just the medicine China's economy needs.